Bigger and faster is good. But smaller and faster is better. The compact SCX-4521FG is an economical and efficient four-in-one solution for home-based and small office settings. Print sharp text and graphics at speeds up to 20ppm. 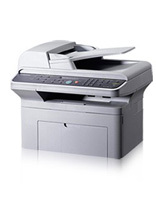 Fax fast with 3-second scan and 3-second transmission speeds. Fax directly from your PC. Or copy and scan with distinctly professional results. The SCX-4521FG laser MFP. Small size. Big results. High resolution 600dpi, at speeds up to 20ppm. One-touch toner save feature extends cartridge life by up to 40%, while still producing high quality prints. Store up to 100 locations in auto dial memory. You can automatically attach your scanned image directly to an e-mail on your computer. Scan documents and convert them to text on your PC automatically. Scan up to 4800dpi for sharp scans from complex colour documents and even 3-D objects. Copy the front and back of a document on one side of the page. Print out an image at up to 300% of original size on multiple sheets of paper. Automatically collates multiple sets of documents. Fits originals of different sizes onto one letter size copy. Print multiple copies of the same image on the same page. Handy for things like name tags. Have a custom setting you use all the time? Just programme it in, and it's accessible at the touch of a button.